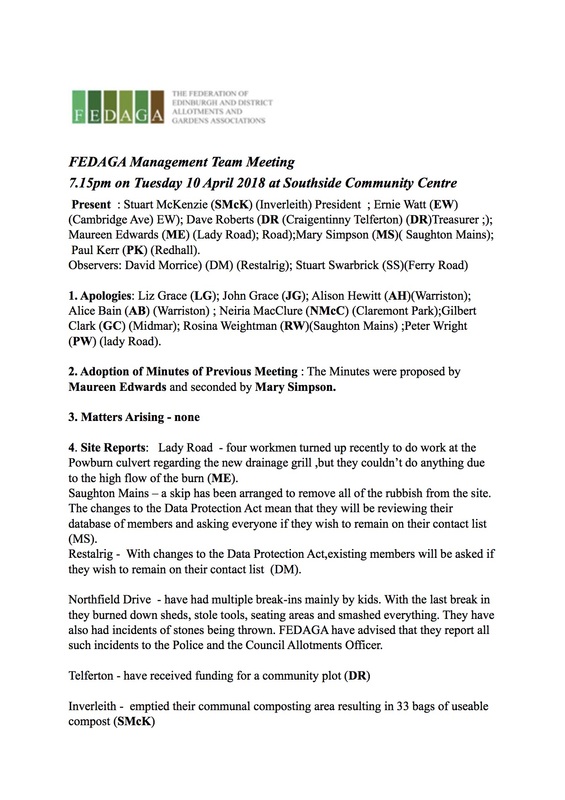 Click here to read the Minutes of the Febuary 2019 meeting. Watch a video here demonstrating the benefits of allotments shot recently at Inverleith allotments, courtesy of Scottish Field. Click here to read the Minutes of the December 2018 meeting. 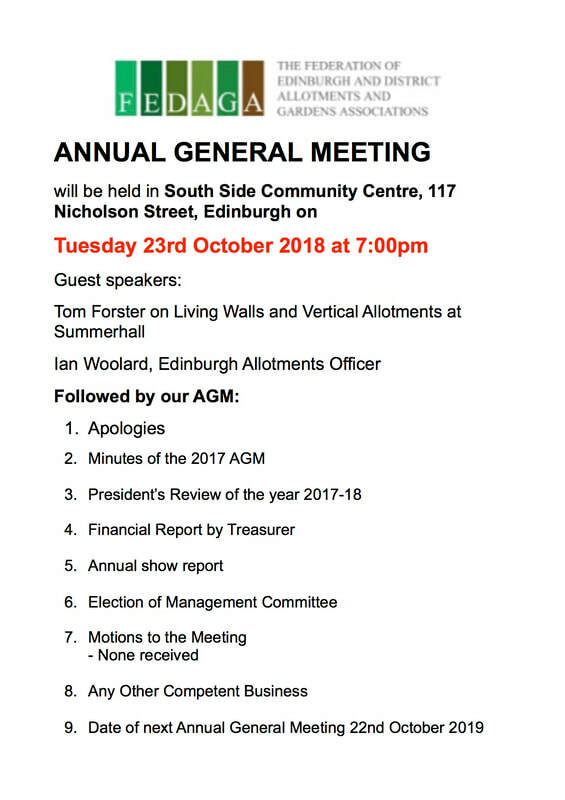 Click here to read the Minutes of the November 2018 meeting. Click here to read the Minutes of the 2018 Annual General Meeting. 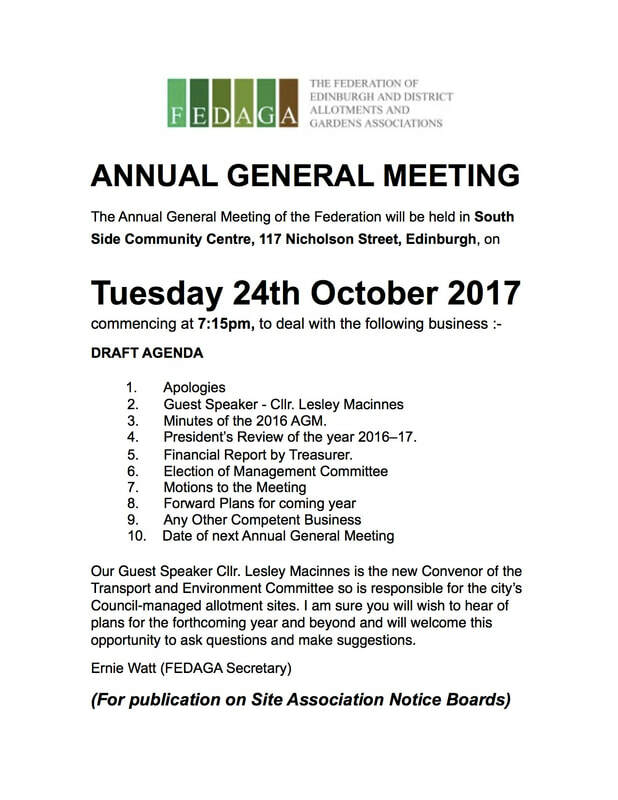 Click here to read the Minutes of the October meeting. 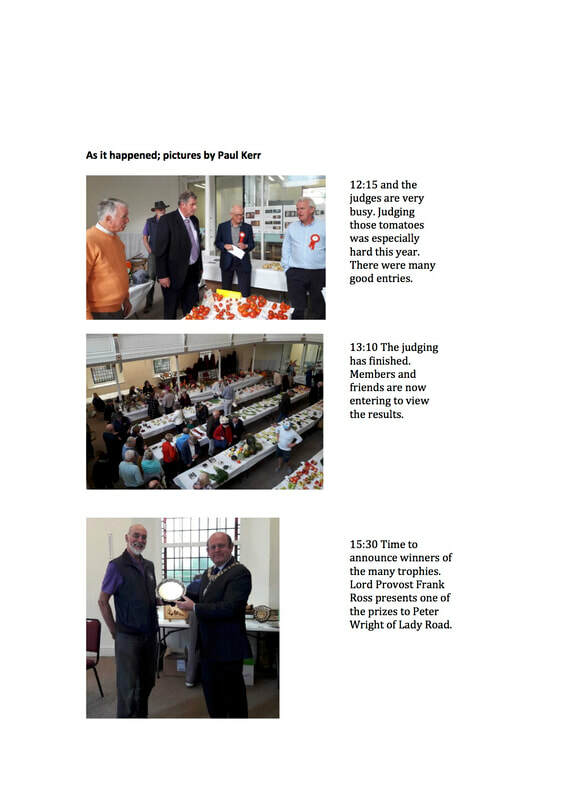 Click here to read the Minutes of the September meeting. ​Do you have experience of growing a community group, small charity or social enterprise? 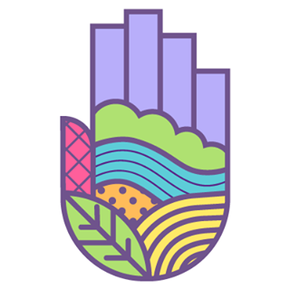 Would you like to be part of a dynamic group of volunteers responsible for a thriving festival of community food growing? Do you have some spare time and the capacity to commit to sustaining your input? 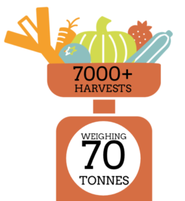 The Power of Food Festival has been growing organically and has developed a wide support base in its first four years. It has now reached a stage where it needs a stronger executive team to take it forward and make the most of the opportunities available. They are therefore looking to recruit several people to expand its capacity and further develop it over the next few years. Skills in the following particularly welcome: social media, partnerships, outreach, admin, bookkeeping, comms & PR, digital marketing, graphic design. Closing date for applications Saturday 8 September. ​Older plotholders will be saddened to hear of the death of Tony Stanton. Tony had a plot at Saughton Mains and was active in FEDAGA both as Treasurer and Secretary for many years. His funeral will be held on Thursday 16th August at 1pm, Mortonhall Main Chapel, and afterwards at Northfield House Hotel on Lasswade Road. All friends and allotmenteers most welcome. Click here to read the June Minutes. Click here to read the May Minutes. Click here to read the Minutes of the April meeting. Notice to Council site plotholders: The Allotment Officer has advised us of a delay in turning water supplies on. I can’t quite remember such a bad start to the spring and growing season since I started in the Parks Department 33 years ago. After the recent wet spell the ground is saturated. In a normal season the sites would be busy and the water would be on. My plan this week was to turn the water on before I go on holiday which is from 9-17th April, however, the weather this week has delayed this. 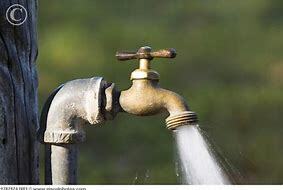 My plan is to start turning the water back on from Thursday 19th April, however, the weather is improving so what I may do tomorrow is turn on the big sites with alkthane pipes. These would be Midmar, West Mains, Saughton Mains, Inverleith, Ferry Road and Warristion and maybe the outlying sites such as Kirklistion and Drumbrae. The rest I can do when I come back. Fingers crossed for a decent summer. Click here to read the Minutes of the March meeting. Click here to read the Minutes of the February meeting. Click here to read the Minutes of the December meeting. 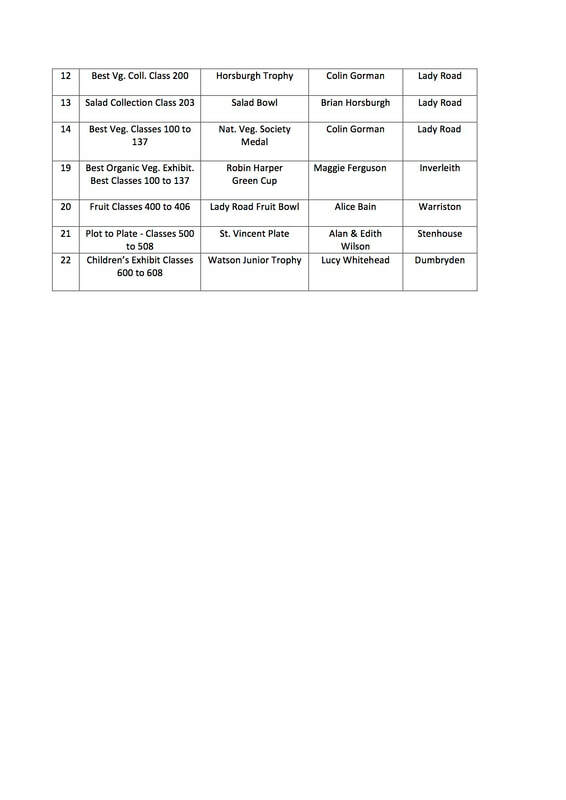 The 2017 Greenspace Use and Attitude Survey repeated questions first asked in 2011 about growing your own fruit and vegetables. Just under a quarter (24%) of respondents grow their own; a decrease from 32% in 2011. Conversely, there was an increase in growing from respondents living in the more deprived areas (20% grow their own in 2017, compared to 14% in 2011). This may reflect the growth of community gardens and stalled spaces growing projects which have been supported in more deprived areas. Most people (87%) who grow their own do it in their own garden; with 7% growing in an allotment and 2% in community gardens. Half of respondents (50%) who do not currently grow their own would like to do so. Lack of a garden is cited as the main barrier (44%), followed by lack of gardening skills (32%), don’t have time (26%) and can’t get an allotment (14%). 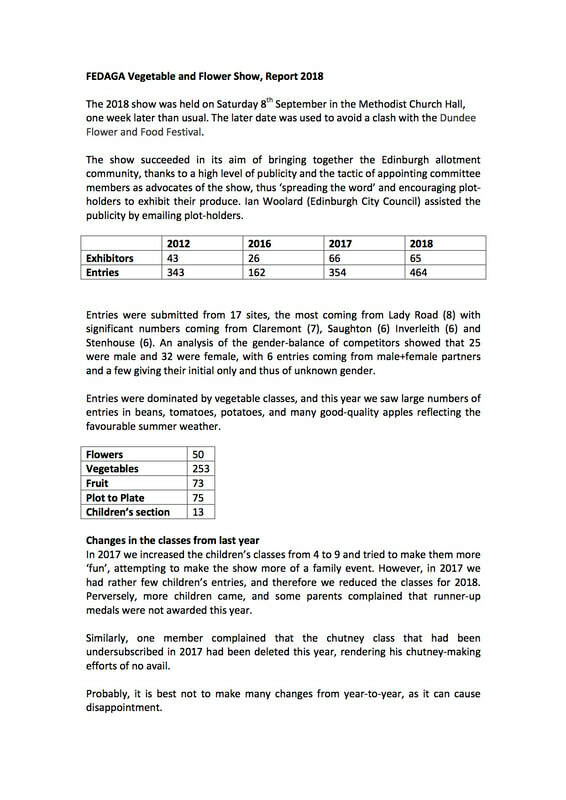 These results provide useful insight for local authorities starting to prepare Allotment and Food Growing Strategies as required by part 9 of the Community Empowerment Act. ​Read a summary of the Report here. This will be key to providing the vital evidence base to support the use of land for growing spaces within our cities and towns, at a time when people are becoming increasingly interested in growing their own fruit and vegetables. Click here for more information. Click here to read the Minutes for November. Filling in online forms is not the most exciting thing in the world, but if you wish to do anything worthwhile today then please spare 10 minutes to look at these questions. The answers will determine how the Scottish Government sets about implementing forthcoming allotment legislation. The consultation is on how statutory guidance for Councils pertaining to allotments will be framed. It is vitally important that a large number of plotholders respond. If the Government gets this wrong (and you never know...) then the potentially strong Community Empowerment Act will wither and die through ineffectiveness. This consultation is of importance not only to existing plotholders but also to those on the waiting list for an allotment. Please look at this SAGS webpage for a bit of background information and click through to the consultation document itself. SAGS have also prepared a one page summary and a list of the questions with their suggested responses. The closing date is 17th November. Click here to read the Minutes of the 2017 Annual General Meeting. Click here to read the October minutes. The Royal Highland Educational Trust are hoping to organise visits to allotments in Edinburgh to help children understand where their food comes from. 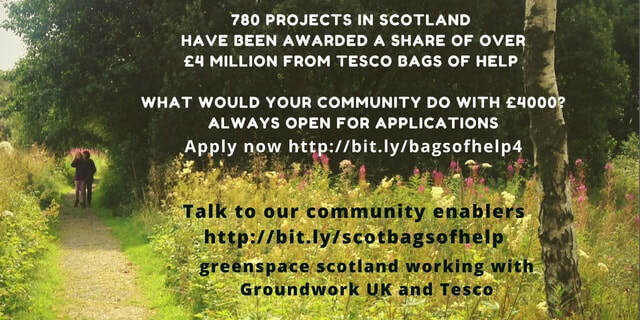 Edinburgh allotment sites are encouraged to help by offering one or more such visits. There are a lot of good reasons why this project should be favourably looked upon. It is believed that once youngsters are introduced to what goes on inside allotments they are much more respectful and the incidences of vandalism that sadly take place may be reduced. 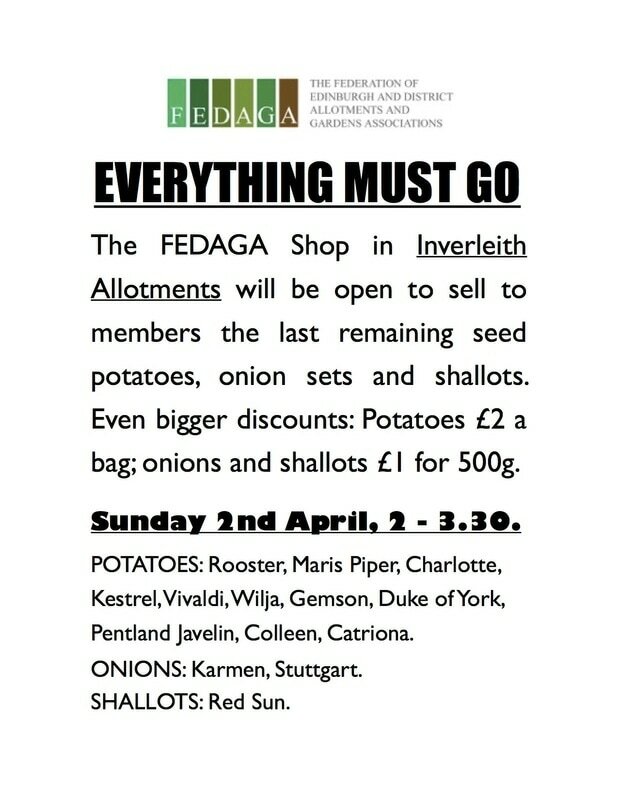 The survival of allotments in may ways relies upon us being seen to be active members of the wider community and FEDAGA has always encouraged such participation. At the end of the day, these children may well grow up to be allotmenteers of the future. Karen is the Lothian Coordinator for the Royal Highland Education Trust. She writes: "We are an educational charity that aims to help children understand where their food comes from. We provide free Food & Farming events; classroom talks and visits to working farms. I am responsible for organising, supervising and risk assessing these visits. Many of the enquiries I receive are from schools wanting to see how vegetables grow. 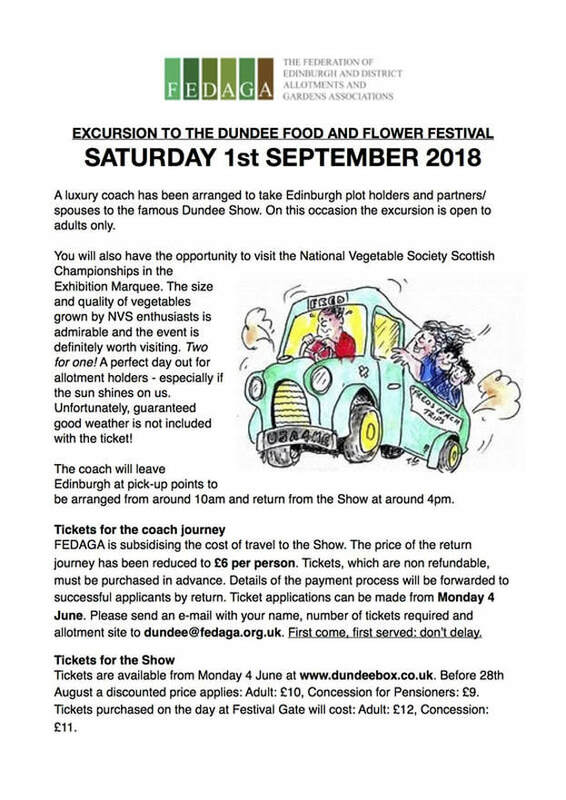 We have a few vegetable farms in East Lothian that host visits but not enough to cope with demand, and it is a long bus journey for Edinburgh pupils. I wondered if we could collaborate in some way, taking pupils on short tours of allotments to see how vegetables grow and help them appreciate the seasonality of food? I look forward to hearing from you." FEDAGA is pleased to announce that Edinburgh Zoo is offering free "Zoo Poo" to members. Due to the location of the manure on site a staff member will need to be present and there is a no driving policy on site during core hours. 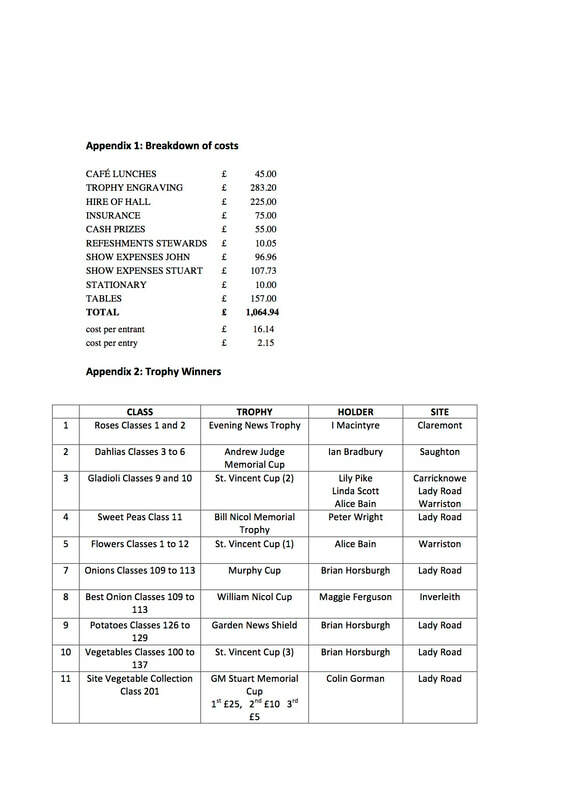 Collections points can be discussed with Robert – location may vary depending on the amount. The manure is completely organic hoofstock waste, so there should be no issues with contaminants. Do you find yourself wondering what to do with everything you grow on the allotment? ​If you have a glut of something then let us help. We want to make sure that everything you grow gets used. We are trained chefs and we want to transform waste into something wonderful. 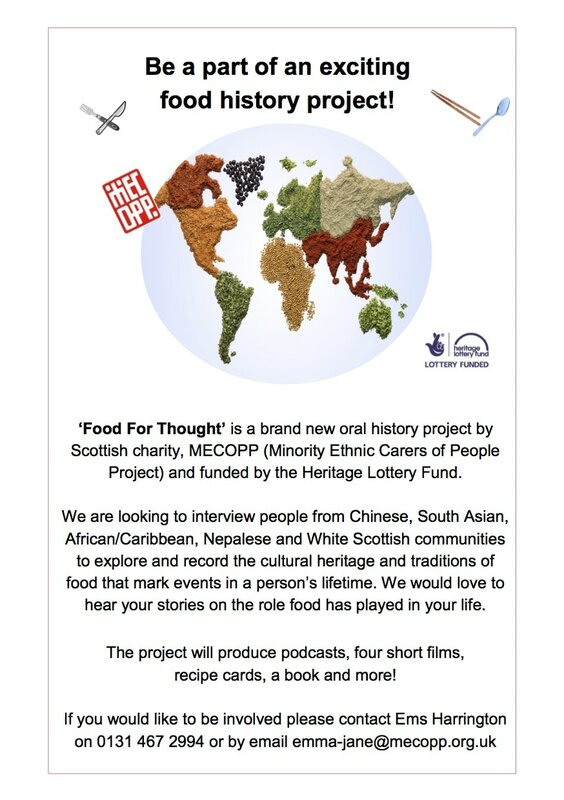 ​By cooking/pickling/chutneying your excess fruit & veg, then selling them locally, we’re raising money for Edinburgh based charities that help educate children on healthy living and eating. 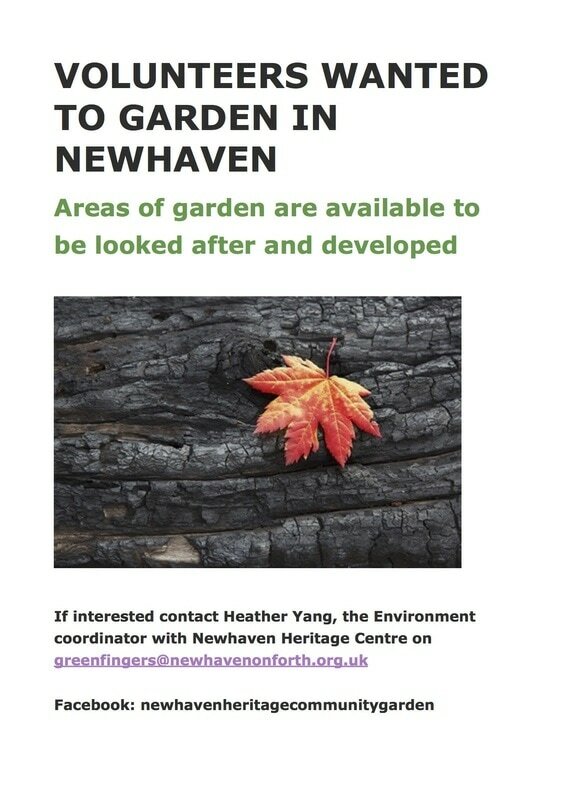 If this is something you’d be interested in, please let us know and we’ll arrange collection boxes for your allotment. Click here to read the Minutes of the July meeting. Click here to read the Minutes of the June meeting. All site representatives are invited to attend the next Management Committee meeting at the Southside Centre, Nicolson Street, at 7.15pm on Tuesday 13th June to pick up cheques for their site subscriptions and rebates from trading schemes. 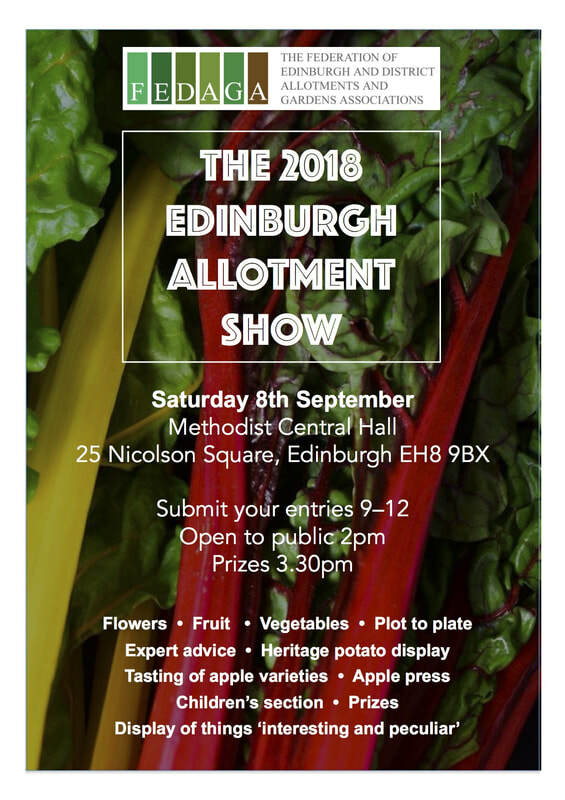 Also available on the evening: publicity material for the Edinburgh Allotment Show. Click here to read the Minutes of the May meeting. FEDAGA welcomes the adoption of this strategy to empower Edinburgh communities to fund, build and manage their own allotment spaces whilst also ensuring every inch of our precious allotment stock is used effectively. We look forward to working alongside the Council Allotment service to achieve these strategic objectives. The City of Edinburgh Council is set to improve access to and management of allotments in the Capital in recognition of their social, environmental and health benefits. Members of the Transport and Environment Committee approved the Council’s third allotment strategy - Cultivating Communities: A Growing Success 2017 – 2027 on Tuesday 21st March. Since the first strategy was implemented in 2002 allotments have surged in popularity, with 2510 people currently on the waiting list for 1488 plots, compared to 417 people waiting for 1065 plots in 1998. Amongst the strategy’s objectives is the intention to ensure adequate provision to allotments by investigating potential new sites, encouraging people to develop and manage plots on Council-owned land and the creation of allotments as part of the planning process for new developments. Transport and Environment Convener, Councillor Lesley Hinds, said: “The popularity of allotments has soared over the last couple of decades, as people recognise the many benefits allotment gardening can offer in terms of healthy eating, relaxation and social interaction. Since the implementation of the first allotment strategy in 2002 the Council has increased the number of plots by more than 400, improving the quality of existing sites, giving more people access to allotments and promoting food growing initiatives citywide. More recently, the Community Empowerment (Scotland) Act 2015 placed a requirement on local authorities to provide and protect existing allotments. The latest strategy aims to support this through four objectives – to ensure adequate provision, develop robust management, improve customer experience and adopt revised regulations. A series of actions linked to each objective have been drawn up as part of the strategy following consultation with stakeholders and allotmenteers. As well as investigating a list of potential new sites for allotments, the strategy aims to ensure allotments are accessible to all and promoting biodiversity on new sites. A key focus of the new strategy is to engage the community to take ownership of their own sites, in collaboration with the Council. Guidance for plot inspections to enhance quality and a proactive approach to the allotment waiting list will help achieve the robust management of allotments, while a website and the use of social media are proposed to improve the customer experience. Plotholder training, in partnership with the Royal Caledonian Horticultural Society, The Orchard Project and Scottish Rural University College, will also be on offer to new plotholders. Read the Strategy document here. Click here to read the Management Committee minutes for February. Why allotment holders should continue to be members. You will notice from your invoice - due at the end of January - that this year the Council is asking all users of the allotment service to confirm their subscriptions to FEDAGA and your Allotment Associations. 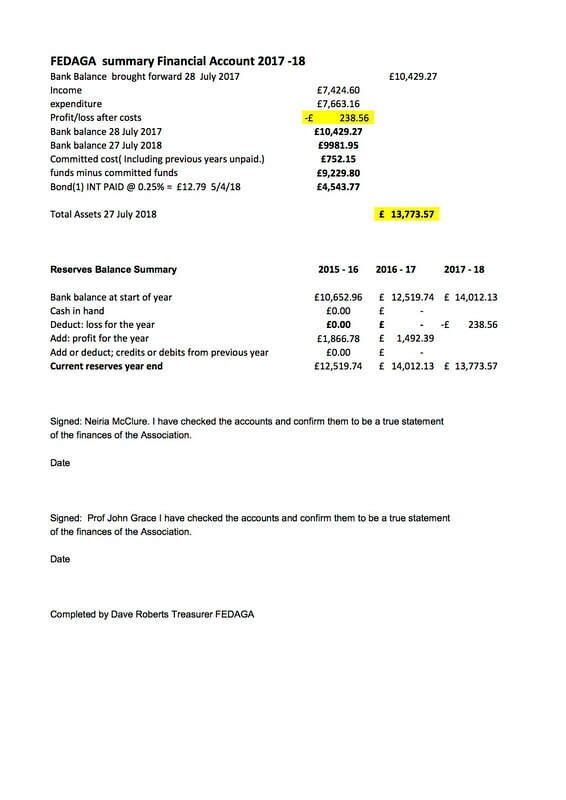 The cost of annual membership is minimal: £1.50 to FEDAGA and £1 to the Site Association. • By continuing as a member you will be supporting those volunteers who work to advance the interests of all allotment holders. You will be participating in the democratic process that has been in place for many decades to protect and promote allotments. • You will also be securing an opportunity to make savings by participating in the various Trading Schemes that FEDAGA and your Allotment Associations have negotiated for you. 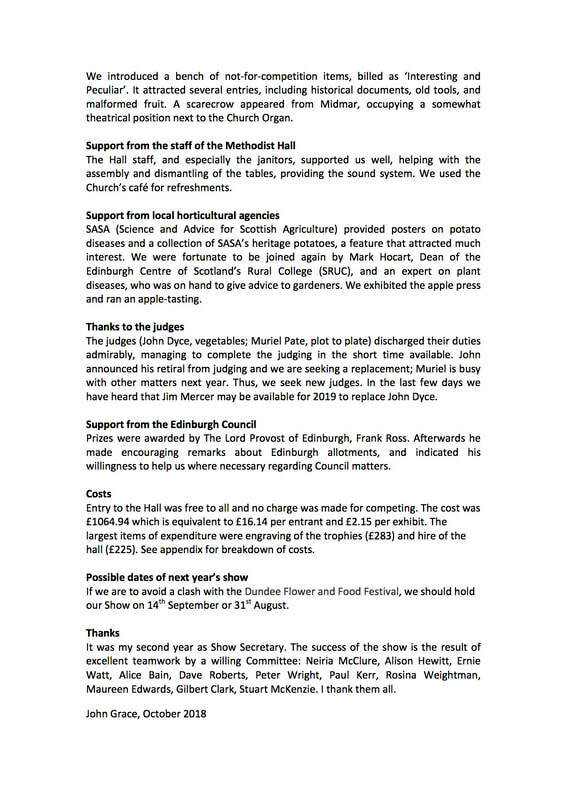 In addition, there are social events such as the Edinburgh Allotment Show, Heritage Potato Trials and site activities such as BBQs, Seed Swaps and the Apple Press that can only exist if there is a healthy, active representative body ready to make it happen. • FEDAGA and many Site Associations maintain a website and issue regular Newsletters via e-mail or in print to keep people in touch. Allotment communities work better for all if there are good lines of communication and everyone is involved to a level they are comfortable with. I hope you will agree to continue to be a member of FEDAGA and your Site Association. By working together we have stopped the closure of allotments and successfully argued for the creation of more sites in the future. We have also resisted unreasonable rent rises and consistently made the case for a better, more efficient allotment service. Allotments depend on their tenants to look after them. By agreeing to pay your subscription (equivalent to the price of one cup of coffee) you will be voting to ensure the continuation of the democratic bodies that are dedicated to the protection of the valuable haven that is so important to you. Best wishes for a productive 2017. Ernie Watt (Secretary, FEDAGA), January 2017. Here is a link to grants for local projects. There are opportunities for some of our more historic sites to apply for some funding to do a bit of research. The closing date is end of January. The application form looks quite user friendly. Eddie Sirling (tel 07525 831417) has a yard at Wallyford and is selling the above for a nominal fee.